Is there a way to display meminfo in Linux top in terabytes, gigabytes and megabytes? with the 'E' interactive command. If -M does not work you can press E while already in top. E :Extend-Memory-Scale in Summary Area With this command you can cycle through the available summary area memory scaling which ranges from KiB (kibibytes or 1,024 bytes) through EiB (exbibytes or 1,152,921,504,606,846,976 bytes). If you see a '+' between a displayed number and the following label, it means that top was forced to truncate some portion of that number. By raising the scaling factor, such truncation can be avoided. 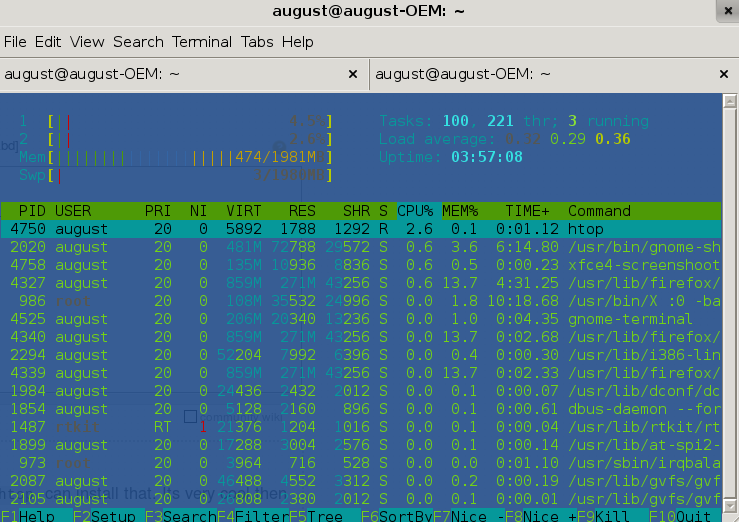 You can also use htop. It's much cooler than top. If you are using Debian or one of its derivatives, then you can install it using sudo apt-get install htop. top -M doesn't work on any of the Fedora, Debian or Ubuntu distros to my knowledge. I just tried it and it's not in the procps-ng package that provides top. There are many implementations of top so one needs to pay special attention to which they use. In general it's best to use free with switching to get the amount of memory free on Linux. You might of noticed that on CentOS 5 & 6 as well as RHEL 5 & 6 that top -M appears to work. This is because those distros ship with the original version of procps. The project was forked and there is now another project procps-ng. Some of the details as to why there was fork, from the Fedora Project's page. Old (legacy) procps tools had no updates for several years and that led to a massive code split caused by a local-only application of distribution specific patches, which were not merged upstream. The project became hardly maintainable since some of the newly written patches were incompatible with sources maintained by other distributors. A similar incompatibility could be noticed in the applications behavior and their command line switches. This inevitable update can be understood as an effort to unify the procps tools across all Linux distributions. So to be clear, the forked project, procps-ng is what Debian, Fedora, Ubuntu, and other distros are using, the legacy project, which does support top -M is still in use of several of the longer term releases that don't keep up with the latest and greatest. NOTE: I downloaded the latest version of procps-ng, "procps-ng version 3.3.9.1-14ef" and it too was lacking the -M switch. In running free with switches you can see the most likely reason as to why the lack of units feature is missing from procps-ng's implementation of top. Rounding becomes problematic, so I believe, procps's implementation avoids the issue by not offering the ability. 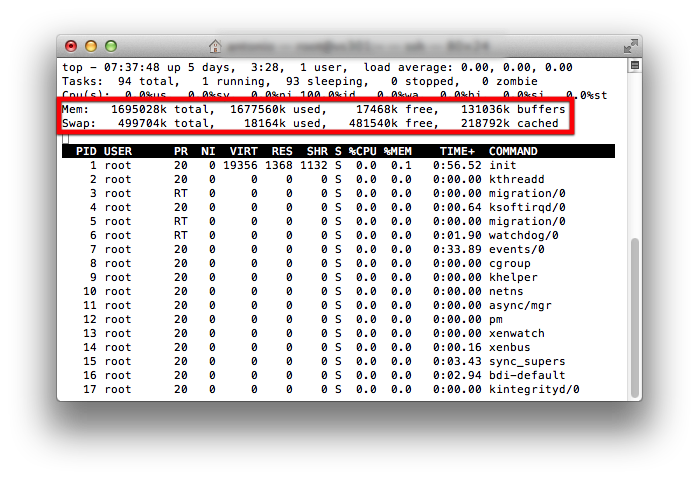 Does an OK job of showing aggregate memory usage. In my opinion a better tool for looking at memory. 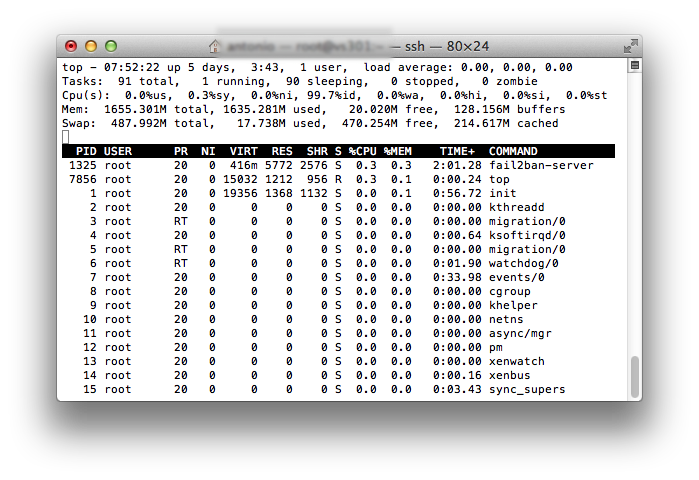 Another useful tool is nmon for looking at system performance. OR, after starting top, type capital E (then W to write the config). One of those should work for nearly everybody (except Solaris, of course, where you'd be lucky to have top at all). bonus tip : every time you start a top instance on a new install, type ExyzW to save colours and highlighting and units - what a relief! 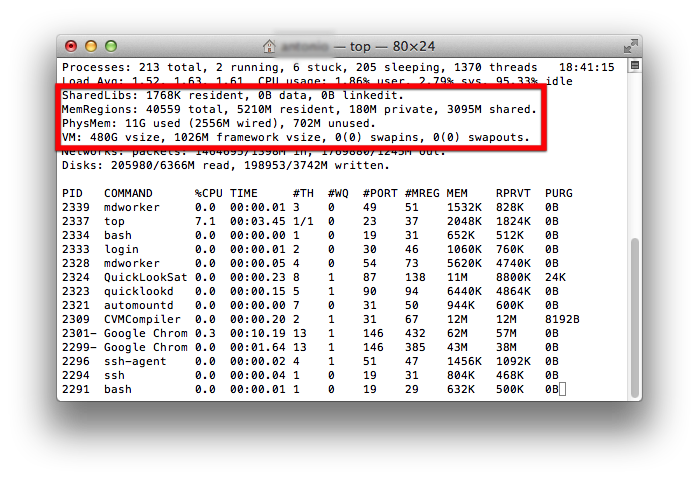 On RHEL7 top shift + e or CspsLK ON. You need " E " capital alphabet. You will get in MiB, Gib, TiB, PiB, EiB. All these you can access. 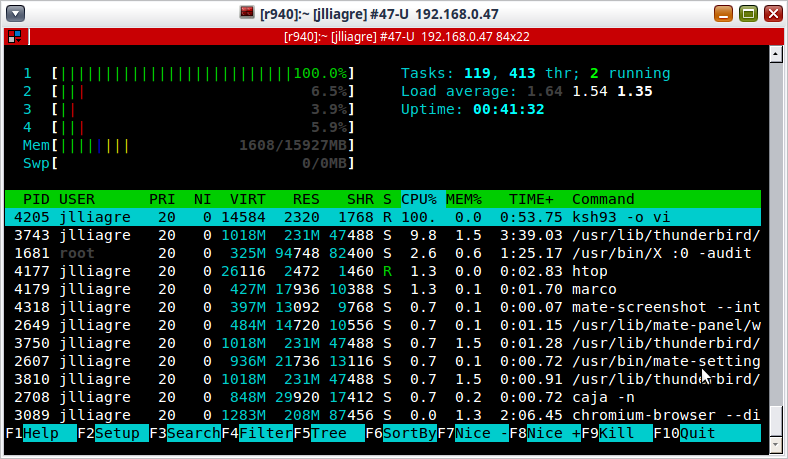 And also you can you htop command which should be downlaoded and installed on rpm base system. Not the answer you're looking for? Browse other questions tagged linux memory top meminfo or ask your own question. Human readable memory sizes in top?